What is the purpose behind the Academy Alumni Scholarship? While not every student who studies with HSLDA Online Academy in high school will attend Patrick Henry College in the future, we know that many students who take Academy classes are interested in Patrick Henry College. 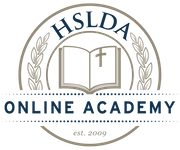 In Fall 2018, 24% of Patrick Henry College’s incoming freshman class had taken one or more courses with HSLDA Online Academy during high school. We understand that paying full tuition for private education is expensive, especially for single-income homeschooling families, whose students make up a large percentage of the demographic in HSLDA Online Academy classes. We want you to continue taking challenging courses in high school that prepare you to be successful in college, knowing that your investment in high school learning now is money set aside for an excellent college education later. That’s why HSLDA Online Academy and Patrick Henry College have worked together to create the Academy Alumni Scholarship. It’s more than just a scholarship. It’s a chance to get ahead in high school and not allow finances to stand in the way of accomplishing your goals.